Science teachers specify our mobile science lab tables with solid epoxy resin table tops - for their extreme durability. Choose laminate-topped science tables for lighter duty, Chemguard tops for their Class 1 fire rating, or waterproof phenolic resin tops for their acid-resistance. Their mobile features allow science classrooms to be configured into various science lab settings for different experiments. Most mobile science lab tables feature demonstration mirrors so that the entire class can view experiments or dissections. 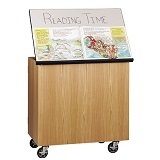 With plenty of cabinet storage space, these mobile lab stations are ideal to complete any science lab classroom. Purchase our science tables, lab stools or casework cabinets to furnish an entire science laboratory.